Hi friends! with nutritious spinach and cottage cheese, here is a yummy recipe for your party menu! Wash, remove the stems and cut spinach, pressure cook spinach with quarter cup water.The moment pressure is formed, switch off the stove. keep aside to cool. When cool, refresh in chilled water, blend spinach in a blender with the green chilies in, to a puree. Cut the paneer into big cubes, take a nonstick pan and fry the paneer pieces lightly and keep aside. Heat ghee or oil in a kadhai / wok or heavy bottom pan ,add cumin seeds. Add onion sauté until light golden brown, add garlic and sauté for half a minute. 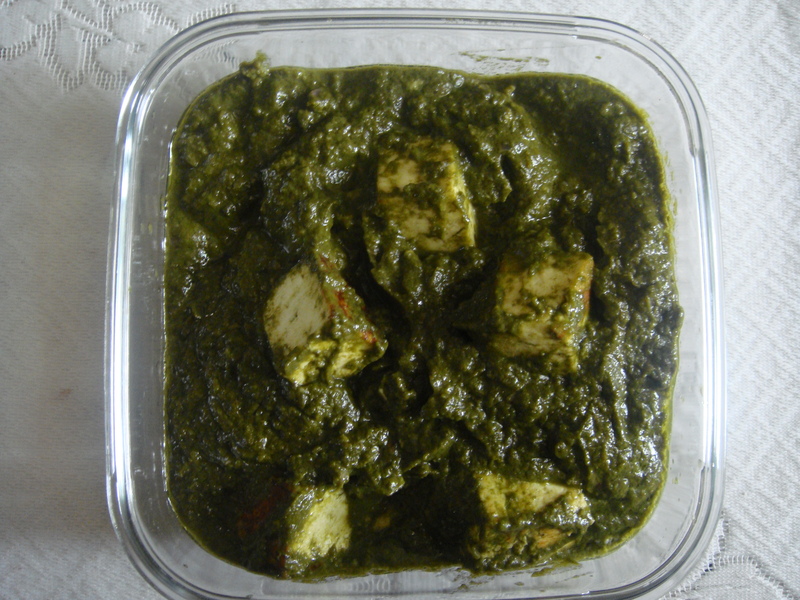 Add spinach puree, salt and when the curry comes to a boil, add the fried cubes of paneer/ cottage cheese and mix well. Cook for 3-5 minutes on low flame stirring frequently. Stir in lemon juice. Finally add fresh cream. Cook for about five minutes on low flame. Serve hot with Chapaties/ lachcha parantha or any other Indian bread of choice! Note: To get best results, do not overcook spinach, overcooking will change the bright green colour of the spinach and also the taste. Paneer is a type of cheese. It is the Indian name for cottage cheese. Paneer, unlike other cheeses, has not been matured and it is rather bland. Paneer is a fresh and delicate cottage cheese made from whole milk in India. Paneer is rich in nutrients. It is a high protein food; it is often substituted for meat in many vegetarian entrees of Indian cuisine. It is commonly used in curried dishes. Paneer is quite easy to make at home. Bring 1 litres of fresh toned milk to the boil. Add one table spoon of vinegar or lemon juice or 5-6 table spoons of curd and stir well. The milk starts curdling, pore it in a clean muslin cloth, kept in a strainer. Leave it in the strainer and let it drain well. To form a thick rolled, formed dough like shape, place it under a heavy saucepan full of water or any other heavy object, for approx. 30 minutes. While making paneer from milk, retain the paneer water. This nutritious water can be used for making soft dough for chapattis or any other Indian breads, can be used to cook dals.